Puregold Price Club Inc. was introduced in 1998 with its first store opening in Mandaluyong City. The store offered a wide array of goods from groceries, apparel, household accessories and furniture at very affordable prices. During that time, the one-stop shopping philosophy was still a novel idea to consumers but with the excellent service and quality products it provided, it did not take long for Puregold to make its mark in retail industry. 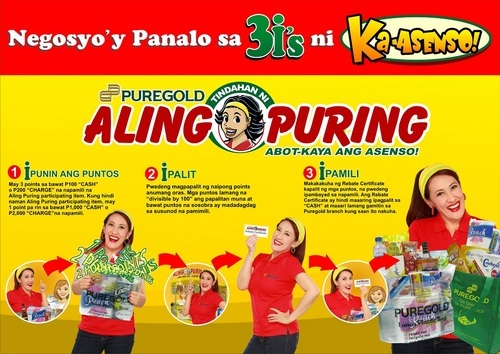 Puregold launched its Tindahan ni Aling Puring (TNAP) in 2003. TNAP is a customized membership program designed specifically for Puregold's primary customers from the Micro, Small and Medium Enterprises (MSME's) such as the sari-sari stores, minimarts, karinderyas, catering and other types of resellers. TNAP members are also called Puregold Ka-Asenso's! Tindahan ni Aling Puring has 2 Types of Card Membership, the Green Card and Gold Card. TNAP Green card is the entry-level card of new and active members of Tindahan ni Aling Puring. This card may be used at any Puregold Price Club or Puregold Extra store. TNAP Gold card is awarded to members who reach a minimum purchase of 1.3 million annually. - Gold Plus Points and Gold Rewards (An incentive Program which rewards members when they reach set purchase target. - Gold WIN - Welfare Insurance (A grant and access to Accident, death, Disablement & Calamity Insurance for Welfare and Business Continuity. The "Perks Card" is a loyalty card program that rewards the shoppers with points every time they shop at Puregold Price Club, Puregold Junior and Puregold Extra. Puregold Price Club Inc.is our signature hypermarket format through which we conduct our primary operations. Needless to say, it remains our biggest contributor to both revenue and gross profit. Close to or at the center of urban hubs, every store offers a wide variety of food and non-food products, with a customer base that ranges from retail customers to small business owners who re-sell products through community (sari-sari) stores, mini-mart, cafeterias, restaurants, bakeries, and pharmacies. Each store offers 30,000 to 50,000 SKU's with the average net selling area of 3,000 sqm. Launched in 2008 to serve retail customers in residential areas, Puregold Jr supermarkets are offering targeted consumer items and a limited variety of general merchandise, without wholesale operations. They offer a higher proportion of food to non-food products with emphasis on fresh products. While its basic store layout is similar to the original hypermarket, these outlets are considerably smaller. The net selling space of a Puregold Jr. outlet is 900 sqm. And carries around 5,000-8,000 SKU's. We love to hear from you. Please contact us.